Andy Wiggins with a 20lb Sea Liced Hen caught 3rd May 2012 on Cornhill. One of three, including 10lb & 8lb over 3 days. Huge thanks to Brendan (pictured) for his help and for tolerating all of the Wiggins family! Thank you too Andy for taking the time to send us the image, so pleased you enjoyed your trip. 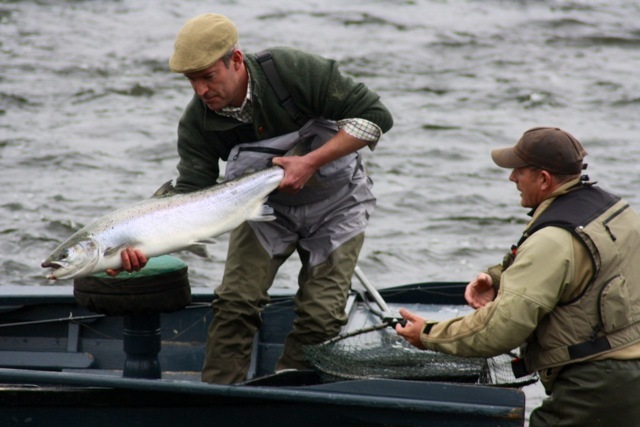 This entry was posted in Uncategorized and tagged Angling, boatmen, Cornhill, fishing, FishTweed, gillie, River Tweed, salmon, season 2012, spring salmon, Tweed, Tweed Valley. Bookmark the permalink.